Congratulations to Leaky Roof II – one of three getting all answers correct, but judged the winner on their anagram of West Highland Yachting Week – Decathlete Whisky Whanging. Having arrived in Tobermory for lunch time on Wednesday, a good rest was had before races resumed on the Thursday morning. With around 5 knots of breeze, classes 1-5 were able to set off around the course before we were becalmed on the start line meaning both class 7 and 8 weren’t able to hone their starting routines. Mr Tunnocks had obviously seen this coming as he waited alongside Chico for them to recall the fleet. A well managed light spell by the race committee saw a restart of race 1 for the Tunnocks fleet. This new batch of wind was steadier and allowed for a good race in light to moderate conditions. A special mention to Gigha being single handedly sailed around the course without a hitch. The second race saw a 90 degree windshift and Lodestar altered the buoys accordingly. The sail changes became slicker and the shouts from the helm became calmer as winds eased off towards the end of the race. Lady Ex impressively sailed her spinakker through the line to end the days racing with a flourish. The real race then commenced to grab the last spaces on the Tobermory pontoons. Class 8, however, know when a battle is lost so enjoyed the sail across the channel all in time for the annual class party. Many thanks to Scintilla and Marisca for hosting! After a short time the race officer decided to give it another go, the roof had a chaotic restart but managed to dig themselves out and worked hard to claim second place behind Sea-Pie of Cultra. 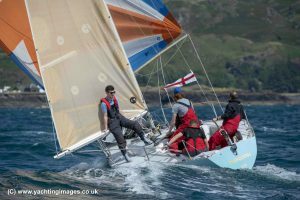 There was a wafer cream thin chance of us having a perfect start and we ended up pushing shadowfax and ourselves over the start line, because of this we had to jibe putting us on the port tack which actually benefited us in the long run. The rest of the race was mainly traffic management over the four rounds before we bagged ourselves a cheeky first place, you could even say the roof was on fire ! On the way back to Tobermory we put the tunes on, laid back and had a wee ‘daydream with a wafer cream’! So what’s the story in Balamory wouldn’t you like to know. Well, today was a 23 mile passage race from Oban to Tobermory with an extremely early start time of 07:55 that was as horrible as it sounds but once everyone was up and changed into their water-proofs we were ready to go ! Some misleading information about the position of the start line from a certain team member meant that we weren’t as early as we would have liked, but, we still made it in time. 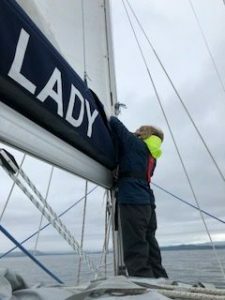 Leaky Roof 2 had a great start after class 7 had a general recall giving us clear air and plenty of space to work our way up the Lismore shore with Shadowfax and Leaky Roof 2 tacking off early for fresh breeze, this led to them establishing an early lead. Whilst trying to go round the outside of the Sgair Nan Gael island, we noticed Shadowfax sneaking through the inside of said island and Lismore light, after some deliberation we decided to follow the local knowledge through the small gap without once taking our eye off the depth ! Very shortly after squeezing through we put the kite up and were off to Tobermory where we worked extremely hard to get clean air stopping the big boats from going to windward of us. Leaky Roof 2 briefly gained on close competitor Shadowfax before they managed to escape again in their own wind finishing first in our class. Once back in Tobermory we settled down for T and medals. T being Tennents and medals being the extra boxes of Tunnocks Caramel Wafers thrown over to us. 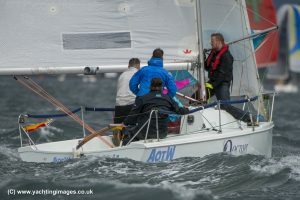 Day 3 of West Highland Week for Autism on the Water and the rest of the fleet in the Tunnocks fleet saw very strong winds and big seas as well as a return of the rain! All spinnaker classes had a epic race with the strong winds and big seas making for difficult steering for skippers. For Autism on the Water with Matthew Thomas coach of Team New Zealand Sailing team calling tactics, we had a SUPERB race flying the spinnaker on each leg touching at least 20kts boat speed with the crew sitting well back of the boat and the skippers heart rate 50 times faster!!! However Salamander along with Cool Bandit and Piecemaker took deserved first three placings with the conditions suiting the boats perfectally. We had a fantastic 4th place which was a very good result for us! We also shout out to our friends on Shadowfax who were leading Class 5 and and entertained the committee boat with a spectacular broach which cost them places! We’ve offered coaching sessions for a decent price! But are impressed with a slick recovery! For me personally it’s so special for me to have my own boat here. 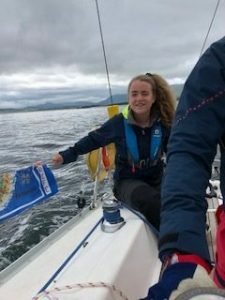 I am so passionate about raising awareness of autism through sailing, it’s a sport that requires serious confidence and problem solving skills. For me that was tested big time and honestly sailing that fast was mind blowing. I want to thank my crew for all their efforts in tough conditions and for helping me embrace the difference as we sail and also our thanks to our sponsors Octopi Engineering for making it possible to be here. Having competed for so many years as crew I never thought I’d see the day I’d have my own boat here racing competively in tough conditions. I’m autistic myself and I certainly have made some dreams come true this week. 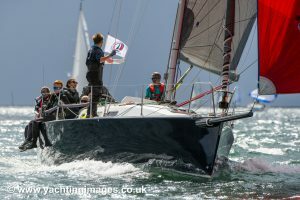 Once again it was another dry departure from Craobh with the champagne sailing southerly winds reaching 24kts at times. Lots of boats made the decision to add a few reefing lines to their mains and number 2’s. With a lively and gusty start the class 5 boats were off on a very splashy 3 mile beat with lots of serious hiking involved! 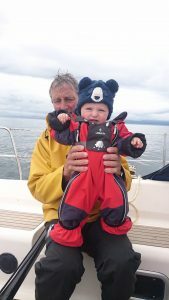 Heading round the Isle of Shuna we had a 17 mile spinnaker run toward Oban which thankfully stayed dry for the whole stretch. During this time Warrior from class 1 had a rather exciting turn of events when their kite breached and knocked their jib into the water which they didn’t realise until quite some time later. On board Leaky Roof 2, there were no repeats of yesterday’s head smashing and again using the Tunnocks kit for inspiration. Today I went sailing with Mummy on Granny and Grandad’s boat. I woke up nice and early to prepare for a serious day of racing, but I was too excited and peaked early so had to be put down for nap as we left the dock. I’m told that the start was nice and windy without too much drama, and that the windward leg went off without a hitch. I decided to join the rest of the crew about half way down the Sound of Luing, at which point a delicious lunch was served. I remember eating a particularly tasty bit of cheese as the first of the Class 1 boats started to overtake us. Their sails have lots of pretty colours. I chewed on ropes for a bit and had a good play with a winch then daddy sailed past in his boat Satisfaction and I got to wave at all my friends. I got to see a pretty boat called Chico with lots of flags when we finished the race. Mummy said I had to wave nicely at the race committee because they work very hard to let us go sailing. Then Mummy tried to make me have another nap… but I decided I didn’t want one.